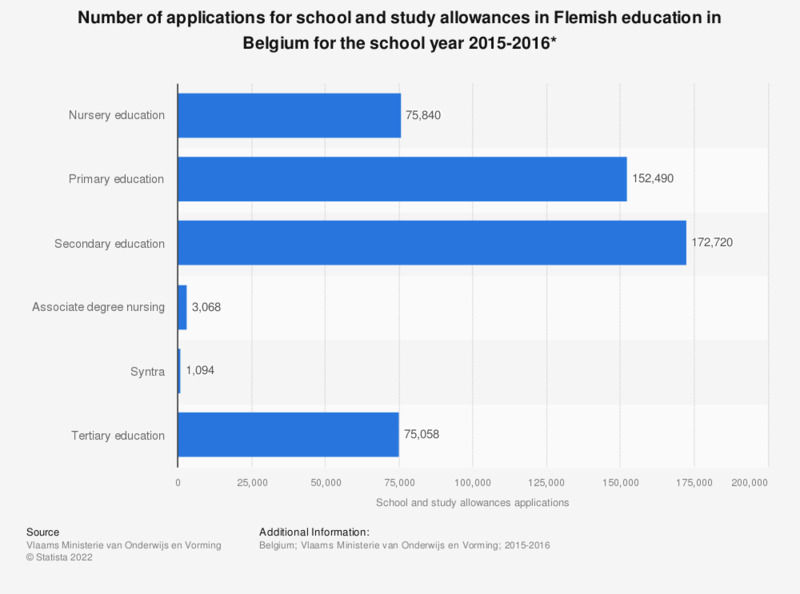 This statistic shows the number of applications for school and study allowances in Flemish education in Belgium for the school year 2015-2016. During that school year, there were approximately 173,000 applications for secondary education school allowances. * Because of different state reforms, education has not been a federal responsibility in Belgium since 1989. Ever since, it has been the responsibility of the three different (language) communities, which are the Flemish community, the French-speaking community, and the German-speaking community. Since there is no federal governmental body that is responsible for education, the figures are published on a (language) community basis. br>The source explains that school allowances are granted to pupils from nursery to secondary education and study allowances are granted to higher education students.